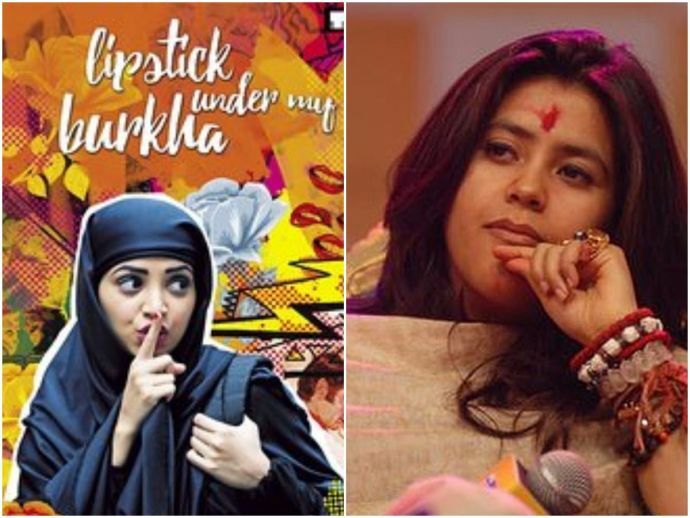 Mumbai(PTI): She is all set to present “Lipstick Under My Burkha”, a film which ran into trouble with CBFC, and Ekta Kapoor has said she does not have any issue with the board as it is a reflection of the mentality of the society. The film, starring Ratna Pathak Shah and Konkana Sen Sharma among others, was in news after the CBFC objected for it being “lady-oriented”. The Film Certification Appellate Tribunal (FCAT) directed the Central Board of Film Certification (CBFC) to grant an ‘A’ certificate to the Prakash Jha-produced movie. “I have no issue with CBFC. My problem is with the entire society, which talks about the same thing but in its own way. So, CBFC is actually mirroring the society. We will trivialise this issue if we make it about CBFC. It’s a larger issue,” Ekta told reporters. “If you talk to a woman, she will give you at least five incidents in a day, 5-10 in a month where she had to prove herself harder of being a ‘woman’, maybe at a male-dominated work place or when she has to try to come across as a smarter woman if she is good-looking,” she added. Recently, the first look of the film, directed by Alankrita Shrivastava, was released which showed a lipstick in place of a middle finger. “This finger, this lipstick is for the society which isn’t allowing us to come out and is curbing our voice. It’s not about CBFC, it’s about an ideology, it’s not even about men. “I am going to do a campaign ‘lipstick for men’. There are lots of men who have made us the women we are today, like my father. There are lots of women who want a son to be born and put their daughter-in-law through abortion. So, it’s not about men and women, it’s about the ideology. It’s about patriarchy,” Ekta said. She said since the film had won several awards internationally, when she went for the screening of the movie, she thought it would be “pretentious, very arty” but was surprised after watching it.